Composed exclusively of Chardonnay harvested exclusively in the Grand Cru terroir of Cramant. Colour: gold and light green reflects. Fragrances of white flowers and light sensations of fresh citrus prolonged by a very mineral texture accompanied by grapefruit. Beautiful final. A great wine especially as an aperitive. To be serve between 7 and 9 ° C.
The Von Mumm family is an ancient family from Germany. In 1761, Peter Arnold Mumm, banked at the time, starts a wine trading activity in the City of Cologne in Rhineland. His sons Jacob, Gottlieb and Philipp took over their father and started in 1827 an activity in Reims in the Champagne region. In 1852, Georges Hermann Mumm (G.H. ), grandson of Peter Arnold, becomes head of the Champagne house, which takes his name. In novembre of 1876, he registers the designation “Cordon Rouge” and puts it on the label. The Mumm House in Reims is a work from architect Kalas. The surrounding walls to the façade, on the Champ de Mars street, are covered with mosaic panels made by Guilbert-Martin according to Octave Guillonet and Joseph Blanc in 1898. We can find five panels that illustrate the main phases of the champagne process, from harvesting to clapping and bottle twining. 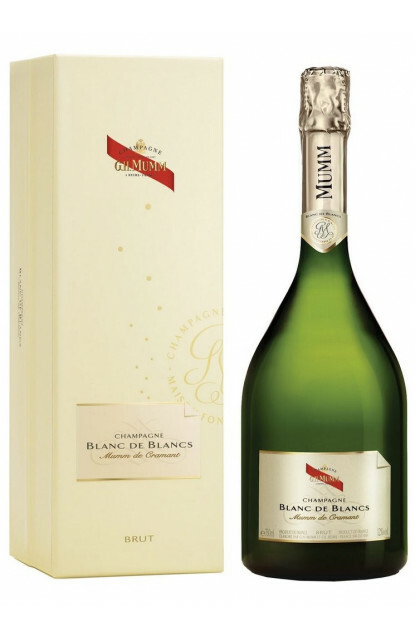 The Premiers Grands Crus House only selected four champagnes in the Mumm Champagne range, all of them exclusively classified Grand Cru : Brut selection, Blanc de Noirs, Blanc de Blancs, and René Lalou vintage.